SUSE OpenStack Cloud is an open source cloud solution, powered by OpenStack and designed to let you deliver the production-ready private cloud you need. 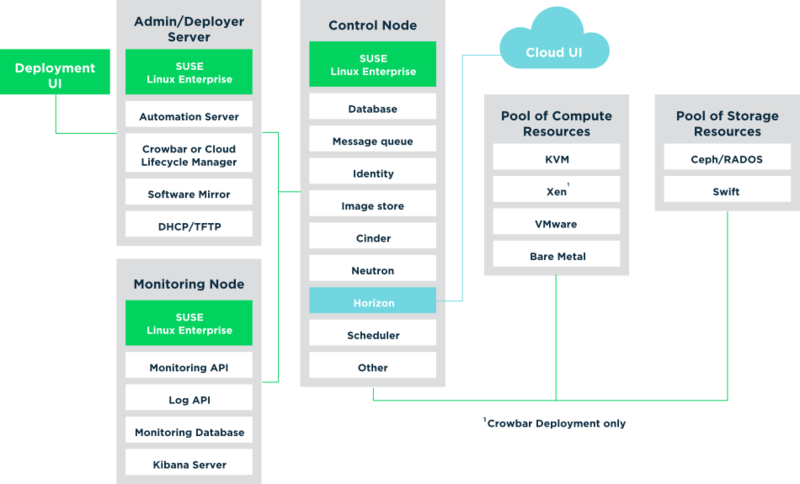 SUSE OpenStack Cloud provides an easy to deploy and manageable heterogeneous cloud infrastructure for provisioning your development, test and production workloads in a way that is supportable, compliant and secure. Our support and maintenance along with the tested and supported integration of other SUSE offerings, powered by Ceph and Kubernetes, provide our customers with the flexibility and ease of use they demand. * The fastest to deploy, configure and manage, helping accelerate the delivery of real business benefits. * Monitor, manage and optimize your OpenStack cloud environment with SUSE OpenStack Cloud Monitoring based on Monasca. To see what the SUSE OpenStack Cloud can do for companies, watch our case study.